When I think of La Prairie, I don’t think of expensive face creams. Instead, I think of Georgette Mosbacher, the powerhouse bombshell who bought the languishing La Prairie in the 1980s, ratcheted up its profits and visibility, then sold it in 1991. Although Georgette runs Borghese Cosmetics these days, a few lessons from her book, Feminine Force: Release the Power Within to Create the Life You Deserve, apply to La Prairie’s new line of fragrances, Life Threads. Perfumer Constance Georges-Picot developed all three of the Life Threads Eaux de Parfum: Life Threads Silver, Gold, and Platinum. 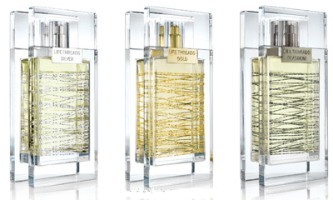 According to the La Prairie website, each of the fragrances represents a different time in a woman’s life. 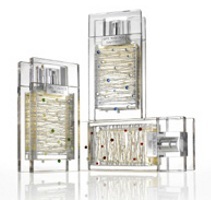 Yet another video promo for the La Prairie Life Threads fragrances (this one is for Platinum). You can see two more videos here and here, or find even more at the Life Threads channel at YouTube. French actress and singer Arielle Dombasle for La Prairie's Life Threads Gold. This is more of a conventional commercial than the "story" video I posted earlier.